Anyone headed to beaches along the eastern coastline this summer is being advised to keep a lookout for any Portuguese man-of-war both in the water and on the beach. The jellyfish relatives have been found washed ashore on a number of popular beaches, with the most recent sightings around the Charleston and Myrtle Beach, South Carolina areas. As beautiful and exotic as the Portuguese man-of-war may appear, it poses a big risk to human health and wellness. The sea creatures look like pretty blue or purple tinted bubbles floating on the surface of the water, and have long, dark purple tentacles hanging down off them. The tentacles are what makes the Portuguese man-of-war so hazardous because they're full of venom and highly capable of delivering a very nasty and painful sting. They should be avoided whether found in the water or on the beach because even days after being washed up on shore they can still sting, no matter how long dead they may appear to be. A sting from one can cause a number of reactions including painful red welts, cardiac distress, fever, shock, an allergic reaction that can lead to trouble breathing, paralysis, and possibly even death in extreme cases which are thankfully rare. If you ever have the misfortune of being stung by one, seek professional medical treatment and do not pee on the area! Contrary to popular belief, doing that will only make it worse and instead you should use a cold compress to help relieve the pain and swelling. While the floating bubble-like marine creatures are commonly referred to as a type of jellyfish, they are actually what is known as a siphonophore. Whereas jellyfish are single multi-cellular organisms, siphonophore are colonial organisms. They are made up of many different individual animals that are interconnected and work together, yet are still capable of surviving independently. This type of physiological makeup is why the tentacles are still capable of stinging even after they become detached. 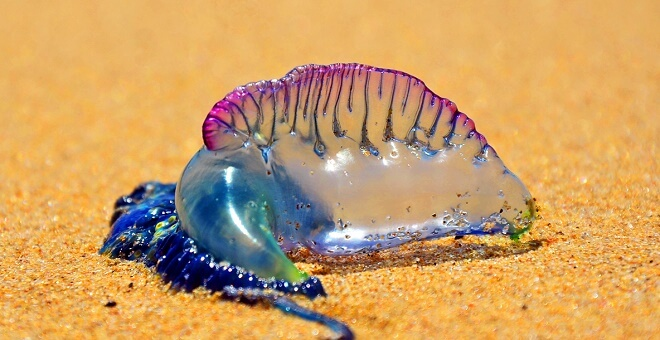 The accompanying New Jersey TV news clip covers more interesting facts and information on the Portuguese man-of-war and what scientists, beach patrols, and lifeguards are doing about them. The news report from Long Beach Island featured the story a few summers back when they were washing up on shore more frequently than usual, which already seems to be the case this year as well. Check it out for more details and if you ever happen to see one of these things in the water, get out immediately!